At Masai Mara Game Reserve, Kenya. The distance from Nairobi is approximately 295 Kms (5 hours) and about 45 minutes by air to Musiara airstrip which is served by scheduled flights twice daily from Nairobi. Little Governors' Camp was built in 1976, around a small watering hole that teems with birds and wildlife. The camp, sister to Main Governor's Camp, has it's own exquisite independent character, in a romantic setting. Getting there is an adventure in itself as have to cross the Mara River, by boat, then a short walk through the forest escorted by armed guards. 17 tents (12 twins and 05 doubles). Comfortable and tasteful spacious luxurious safari tents, tucked away amongst trees, each with a private terrace and veranda from which animals are viewed. In keeping with safari tradition lighting is by gas and kerosene lanterns, or by candlelight, en-suite shower/basin and flush toilet/Bidet; running cold and hot water, 220 Volt plugs at reception and Hot-water bottle in bed. Game package that includes game viewing drives and nature walks. Amboseli National Park, approximately 260 Kms (4 hours) from Nairobi on the border of Kenya and Tanzania. � By daily Schedule flights to Amboseli, Airkenya/Safarilink. 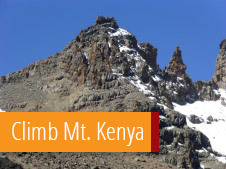 � By road, a four-hour drive from Nairobi. 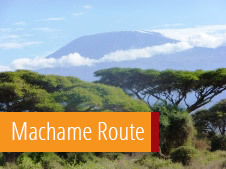 � By road from Namanga (Tanzania Border), a two-hour drive. Ol Kanjau, the �Camp of the Elephants�, is a traditional style tented camp just three kilometres east of Amboseli National Park. The elephant population of the greater Amboseli Basin at the base of Mt. Kilimanjaro now numbers 1000 animals in over 50 matriarchal families and associated bull groups. The Amboseli elephants have perhaps the oldest and most intact social structure of any elephant population in Africa. They are also the best known and well studied. Full board accommodation, including soft drinks, beer and house wine. In addition to close elephant watching some of the other activities which are possible from Ol Kanjau camp include, day and night game drives through the plains of Amboseli, bush walks, bird watching in the vast wetlands and swamps of Amboseli and the woodlands. The Rainy have a special and unique relationship with the Masai allowing for visits to neighboring Masai settlements. 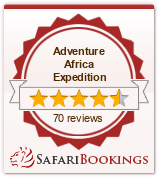 For a real thrill guided walks with habituated baboon troops. You�ll also get an inside view into the on going conservation ecology studies which help balance the needs of pastoral people and wildlife and ecosystem conservation. Mike and Judy Rainy, their daughter Jessica and son-in-law Jeff Worden, are conservationists and ecologists who uniquely provide the ideal base in Amboseli from which one may observe and share in the lives of these most magnificent elephants. The Rainys and Wordens combine ecotourism and conservation science in a very special way that helps visitors play a part in securing a long term future for these elephants in Amboseli. Their goal is to help secure an area that can grow with the expanding Amboseli elephant population, and which can also accommodate the needs of the Maasai pastoral people who own the land around Amboseli Park. Ol Kanjau Camp reveals in very special way the ecological, behavioral, and conservation patterns of animal lives to a visitor that can take a few days to appreciate, observe and wonder about � the accumulation of natural history information that the Rainys and Wordens and many other have taken decades to build. A unique conservation effort at Sirata Suruwa links the Rainys' knowledge of wild animal behavioral ecology to the cultural ecology of Maasai speaking people, an effort that seeks to diversify the economy of their pastoral neighbors by involving them in wildlife husbandry and conservation projects. Each day wild animal numbers, distribution and behavior are monitored closely by resident Maasai and Samburu guardians, and you might be able to join the morning animal count. The Rainy's are old friends of Cynthia Moss, and have known or worked with a number of Cynthia's researchers, who have monitored the Amboseli elephant families for more than 25 years now, on a daily basis. You can't ask for a better insight into elephant behavior, and those that want can visit with this research team. Located on the Western border of the famous Samburu Game Reserve, Bedouin Camp is set within an 83,000 acre exclusive concession of pristine wilderness. It is about 30 kilometers from Archer�s Post. The Bedouin Tented Camp is situated on the southern banks of the Ewaso Ngiro River, on the western border of the Samburu Game Reserve, within a conservancy area. The camp, resplendent in tented finery and comfort, offers a stunning contrast to the surrounding landscapes of rocky hills, shrubs and acacia trees.�To stay at this stunning tented camp is to experience a return to the original spirit and essence of a �safari�, reminiscent of a golden bygone era of romance, adventure and elegance. Here you will experience the ultimate in personalized service. The camp is personally hosted by the owners Craig and Samantha Griffiths. The camp has 8 tents (16 beds), set up between Giant Tortilis Acacias and Doum Palms, on the white sandy banks of the Ewaso Ngiro. Private en-suite dressing rooms, bathrooms with safari style canvas baths, showers and porcelain flushing toilets. Lunch is served al fresco on the banks of the Ewaso River, where the graceful elephants come for their daily drink and wallow. Dinner is served in the shimmering light of the candelabras, or privately under the stars, to the accompaniment of the resident pride of lions� nightly chorus. Dinner is an elegant affair, with silver, crystal, fine wines and freshly baked bread. Proudly adorned Samburu Warriors and liveried waiters attend to your every whim, ever attendant but unobtrusive.� The cuisine and service is of the highest standard to be found in the bush. ��������� Laundry - daily at no extra cost. ��������� Radio contact with other camps. ��������� Sun Downers & Bush Picnics. �Day & Night Game drives. �Fly camps on top of the mystical Mt. Lolokwe. �Massage and aromatherapy facilities are available upon request at the camp. �Helicopter trips can be arranged. �Rafting through the Game reserve. Tsavo West National Park, about 4 hours from Nairobi through Mtito Andei Gate - 65 kms via Kilaguni, Kitani to Finch Hattons (road signs). 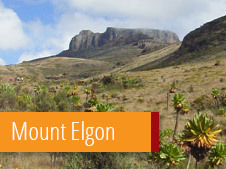 About an hour by air from Nairobi on the East African Air Charters which runs a scheduled service three times weekly from Wilson Airport, departing Sundays, Wednesdays and Fridays and back on the same days. The private all-weather airstrip is approximately 3.5 kms from Lodge (1200m long - 30m wide). Nestling at the foot of the Chyulu Hill, Finch Hattons is one man�s dream of the ideal - a genuine conservation friendly luxury tented lodge, named after the aristocrat who introduced Royalty to the bush and whose style was impeccable. For Denys, Mozart and cut crystal were essential kit and this is the style that gave birth to the ideal that is Finch Hattons. The Main Lodge comprises dining hall, lounge/bar and the terrace, overlooking the main Hippo Pool against the backdrop of Mount Kilimanjaro. Coastal design with pieces of Lamu furniture.� The impression is one of elegance and comfort. The tents are equipped with deluxe beds and all of the amenities of a room in a five-star hotel.� The is supply of electricity (220 & 110), fully stocked mini-bar, en-suite toilet, wash basin and generous slate walled shower room, both complete with piping hot and cold running water, primarily solar heated. Extra wall socket located in the sleeping area with an adaptor for a hairdryer or battery recharging. The lodge surroundings are unfenced. Animals get close to the hotel. Therefore, children to be accompanied by responsible parents and only by prior arrangement. The dining hall has many interesting period features, stone fireplace, high vaulted ceiling, chandelier, latticed windows and doors, dresser, buffets and tables decked in silverware, cut crystal and porcelain, perhaps after aperitifs and an exchange of game viewing tales at the bar. Cuisine and service are to the highest European standards.� After dressing for dinner (no shorts), guests are escorted back to their tents by armed askaris and then.�.left to the wildlife.� Hippo chorus or a lion roar with its triple thud salutation.Terrace overlooking hippo pool and Mt. Kilimanjaro half shaded is where breakfast, lunch, afternoon tea and evening sundowners are served. The Bar/Lounge comprises three areas of comfortable private seating - a favorite being the mezzanine library overlooking the dinning hall. Denys� Bar is supported by a well stocked cellar. ��������� Same day, seven days a week laundry services available. ��������� Lounge and bar area elegantly furnished to create an informal country house atmosphere. ��������� Mezzanine floor - cozy library / reading room. ��������� Vehicles are available for game viewing drives and airstrip transfers. Special occasions can be catered for, i.e. Weddings, Anniversaries, Birthdays, Board meetings, Sundowners in Chyulu Hills or Poacher's Lookout by prior arrangement. Generally warm 22� C - 34�C with a low humidity especially outside the rainy season which is mainly April to June.� The evenings and early mornings can be cool especially when it is windy, so a jersey or light anorak is necessary. Located on a 30,000-acre private farm on the�western edge of Tsavo West National Park, Voyager Ziwani sits on the edge of a small, secluded dam on the Sante River. The camp�s environs are home to hundreds of basking hippos, while a short drive will deposit you among the big game of one of Kenya�s wildest and least explored national parks. The journey to Voyager Ziwani involves a scenic two-hour drive from Mtito Andei or Voi, or a direct flight of 20 minutes from Mombasa or 30 minutes from Nairobi. The main building overlooking the Ziwa�Dam houses our bar and dining room, with a long verandah where breakfast is usually served. In the evening candlelit tables are arranged on the lawn so that guests can dine out under the night sky beside a roaring campfire. Early morning tea delivered to your tent. Childrens� games and activities with our Adventurers� Club. All-weather airstrip on the edge of camp grounds.